Initially designed by MIT in Boston, the Hiriko city-car is a radical new electric car which will be produced by a consortium of seven companies based in the Basque country in Spain, all producing different parts to the car. “Hiriko”, despite the Japanese sounding name is from the Basque language, meaning “urban”. The car is completely pollution free and even reduces in size (folding in on itself) when you need to park it, requiring only 1.5 metres of parking space. The prototype was unveiled in Brussels in January 2012 with José Manuel Durao Barroso, the President of the European Commission in attendance. Barroso was particularly impressed by the economic validity of the project: “Projects such as the electric car by HIRIKO play an important role in responding to the crisis, for it combines new business possibilities with the creation of employment and social innovation”. The idea is to use a fleet of these cars in the same way that Paris and London use their city bikes. The car is intended to be part of a city-owned fleet that people can rent out on an hourly or daily basis. You can pick it up and leave it at a designated station just like a bike. If the concept took off, it would revolutionise city transport infrastructure and parking networks. Mayors and local authorities are facing a serious traffic and transport challenge. There is some surprising data offered by the company that gives an idea of the problems drivers and city authorities are currently facing: 40% of petrol is used finding somewhere to park and 80% of urban trips involve a person travelling alone. Hiriko would solve those problems. For that reason, it is expected that the first clients will be institutions and municipalities, which will use them as fleets in their respective cities. If sold to an individual, the two-seater would probably cost around €12,500. This revolutionary project will allow city halls to move inhabitants about the city in a completely different way, dramatically affecting the way people live. This is why Hiriko is not being touted as just an electric car but a whole new way of living in cities. 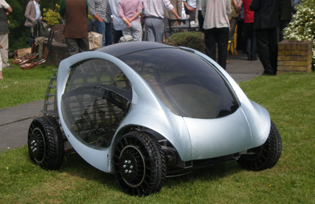 Commercial production of the revolutionary car is set to start in 2013. 9,000 cars per year will be produced by 2015 by the different franchises in Europe and America. So what about the car itself? Hiriko features innovative navigation systems, 120 km autonomy and a 4-wheel drive system with a battery in each wheel. The car can reach a maximum speed of 90 km/h but the speed can be electronically set to stay within an individual city’s speed limit. The Hiriko is a 100% electric and electronic two-seater, capable of folding up for parking and equipped with a state-of-the-art information system so it can always be traced.. The driver and passenger enter the vehicle via the single, flip-up door in the front of the car that also doubles as the windshield. The catch phrase for the project is “Mobility on demand” which means booking your car from your phone or computer, no more petrol price problems, no more pollution, less traffic in the inner city, no insurance and repair problems. The car will have GPS functionality which will identify the nearest electric recharging stations for the batteries as well as official parking places where you can leave the car for the next user. It sounds too good to be true.